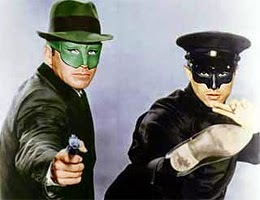 48 years ago on this date of Oct 28 in the year 1966, the 8th episode of the new TV series, The Green Hornet, aired. After Eden tried to have Britt killed by brainwashing Casey, Britt as the Green Hornet goes to Eden and tells him that he knows what he's doing and that he wants in. Eden tells him where his next job is. But instead he brainwashes Vanessa and sends her to see him and places some explosive in her purse.